Poor oral health has serious consequences, including painful, disabling, and costly oral diseases – many of which may be prevented with regular visits to the dentist. 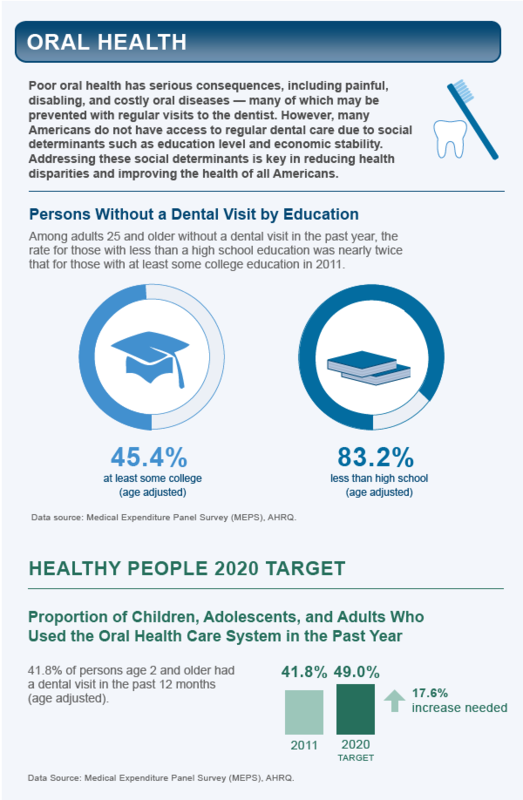 However, many Americans do not have access to regular dental care due to social determinants such as education level and economic stability. Addressing these social determinants is key in reducing health disparities and improving the health of all Americans. Among adults 25 and older without a dental visit in the past year, the rate for those with less than a high school education was nearly twice that for those with at least some college education in 2011. 41.8% of persons age 2 and older had a dental visit in the past 12 months (age adjusted).